While we are strong advocates of the stand-work method over here at Inhabitat, we do realize that it isn’t a practical solution for all workplace environments. But if you’re a desk jockey hoping to get a little more body engagement thoughout your workday grind, then you’ll love the [email protected] Chair. Designed by Benjamin Cselley, this stylish task chair is designed to keep your blood flowing, giving you a head to toe workout throughout the day! The [email protected] is basically a gym packed into a swivel chair. For arm exercises a central mainspring/handle is built into the core of the chair – perfect for some impromptu arm resistance workout. 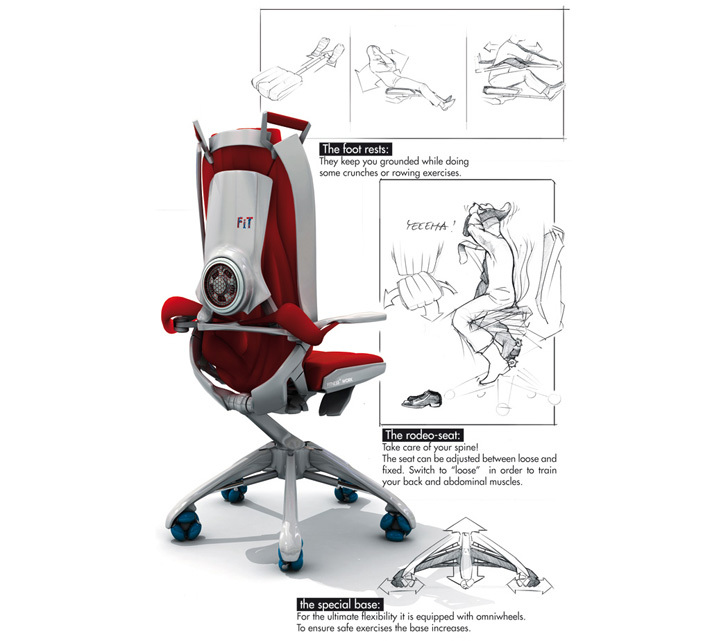 The chair also leans back flat with foot rests to keep you grounded while you work on your six-pack abs. Most impressively the seat can be switched to “rodeo mode”, which loosens the stool and forces you to use your back and abs to keep the chair in balance. While we are strong advocates of the stand-work method over here at Inhabitat, we do realize that it isn't a practical solution for all workplace environments. But if you're a desk jockey hoping to get a little more body engagement thoughout your workday grind, then you'll love the [email protected] Chair. Designed by Benjamin Cselley, this stylish task chair is designed to keep your blood flowing, giving you a head to toe workout throughout the day!